Our practice is pleased to offer same day dental implants, crowns, onlay style fillings, and veneers to qualifying patients. 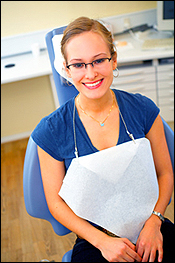 We also provide same day tooth replacement and same day denture repair. At the forefront of dental technology, our practice recently incorporated the Cerec system into the treatment options available to our patients. As a result, we can make a digital scan of a patient's tooth and design and create a custom, permanent restoration in our office in a single appointment. The Cerec system allows us to avoid many conventional impressions and thus make the procedures more pleasant. The digital scan is transferred to the design center where a 3D model of the tooth is created chair side. We then customize the restoration to fit our patient's unique tooth characteristics, after which the new crown is created in our milling unit. The final result is a natural looking restoration that fits extremely well making it virtually undetectable. The elimination of impressions, temporaries, second appointments, and waiting for the permanent restoration elevates the entire dental experience. The Cerec system empowers us to provide dentistry that truly fits our patient's active lifestyle needs.